With February 14th just around the corner, it’s time to start planning the perfect date night. You want everything to be just right, from the first minute to the last second of your romantic evening. That’s where we come in. Five Star Private VIP Tours is more than just Orlando’s premier tour company. We’re Orlando natives that know this city better than anyone else. We know where you should go for the best romantic candle-lit dinner and where you definitely don’t want to go. What’s more, we can help you get there! 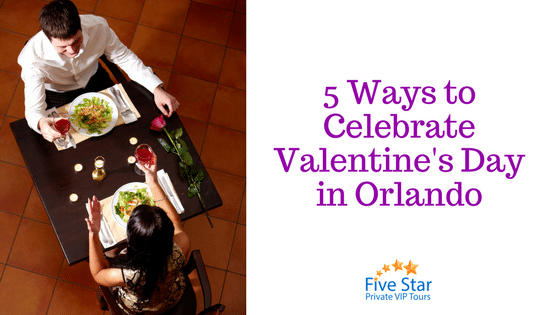 Check out our list of the top five ways to celebrate Valentine’s Day in Orlando and then give us a call to help make your vision for a unique and unforgettable night come true! Valentine’s-themed merchandise throughout all the parks, including special pins and more! We could go on, but you get the point. Valentine’s at Disney is a one-of-a-kind experience that you don’t want to miss. You’re missing out if you’ve never been to the Garden Theatre. Located in Winter Park, this enriching, engaging, and entertaining theater is all about creating unforgettable experiences. Built in 1935, it’s a staple of Central Florida and a great place to spend Valentine’s Day. So, what’s going on at the Garden Theatre on February 14th? They’re doing a special showing of the much beloved Say Anything. Watch John Cusack hold his boombox up for love on the most romantic day of the year. Enough said. There’s a reason that Orlando is called the City Beautiful. Find out why yourself by overseeing the skies in a chartered helicopter ride. You can watch the Disney fireworks from above, and catch the sunset like never before. You can give your date a night they’ll never forget. Staring into the eyes of your loved one over a candlelit dinner is classic for a reason. It never goes out of style and your date is sure to love being wined and dined. So, where should you go for good vino and a mouth-watering meal? We recommend Taverna Opa Orlando, Paris Bistro, American Q, Quantum Leap, and many more. It all depends on what you’re in the mood for. There is no shortage of five-star restaurants in Orlando and the surrounding areas. Our friends at Epicurista wrote a great guide that’s worth checking out! Literally! Head over to the Coca-Cola Orlando Eye, a 400-foot-tall Ferris wheel, to take a whirl among the stars this February 14th. What could be better than slowly panning over the entire city of Orlando with your date snuggled up close? Bonus tip: combine a trip on the Orlando Eye with a private helicopter tour. Valentine’s Day is a time for seeing stars and this combo makes sure both you and date see them! Give us a call today if you want to experience any of these five special Valentine’s Day events in nothing but style. We’re talking about exclusive transportation, reservations at any restaurant, hotel reservations, Disney insider secrets, and more. We’re called Five Star Private VIP Tours for a reason. Find out why now!